The Co-Presidents never put much stock in rural folks tales of very wooly caterpillars predicting a bad winter… until one year when we noticed a squirrel had made a huge pile of fir-cone nibbles, a few months before we were snowed in for a couple weeks. A similar thing happened before the last bad winter: we noticed a squirrel tossing down hundreds of green pine cones, to stash the goodie-parts away for the winter. So a few weeks ago when we noticed that a squirrel had dropped hundreds of these Douglas Fir cones onto our deck, a suspicion grew within us that this winter could be a doozy. So here’s our prediction: 2014-2015 winter in the Portland Oregon area will be unusually cold. There, we’ve put our bet down. Let’s see how winter turns out. You may notice that when you visit Needhamia, your browser now says that you’re using https instead of http. Needhamia now has a site certificate, so that you can be sure you’re talking to the real Independent Nation of Needhamia. Whee! Arun Mota, a design student at Copenhagen Institute of Interaction Design, conceived of a piggy bank that donates a portion of your savings to a cause. The project nicely ties together the cause (electricity for rural areas) and the form (a jar that lights up when you put coins in it). I also love the feasible simplicity and clarity of the mechanics of the piggy bank and the donation system. I want one! I first heard of Tim Hunkin when I watched his TV series The Secret Life of Machines: a whimsical but thorough explanation of how various devices, from elevators to fax machines, work. I was hooked. More recently, I’ve been following Tim’s work at his site, http://www.timhunkin.com/, which shows and describes his fantastic (and fantastical) projects. I love his animated collection boxes / vending machines. 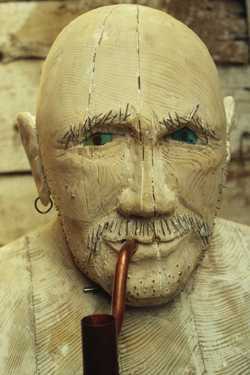 My all-time favorite is Nobby: a sculpture of a lifeboat man, who rattles his box and, on receipt of a coin, nods his head in benediction. It’s a nicely understated and sympathetic experience – I look forward to seeing it one day. It must be based on actual technology, vs. pseudo science. It must be provocative, causing an initial reaction of horror or revulsion. The horror or revulsion must be based on the concept rather than being simply disgusting. It must have an artistic element, vs. being just science. 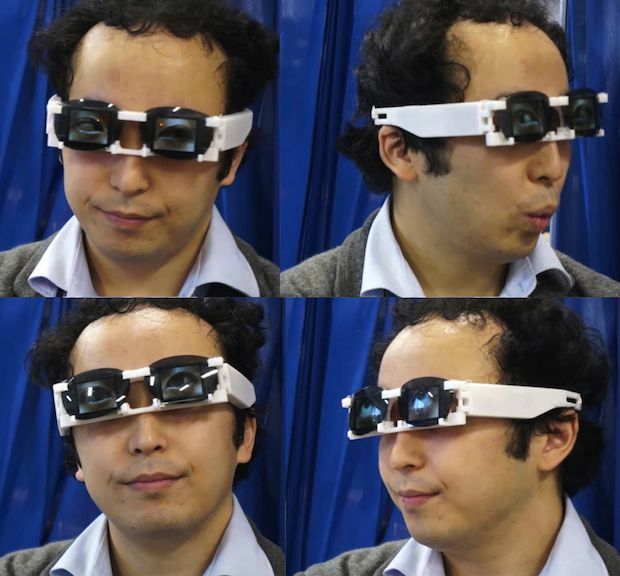 An April IEEE Spectrum story covers a work that wins on all counts: Dr. Hirotaka Osawa’s Wearable Eyes, designed to let you look like you care when you are phoning it in or even asleep! Check. It’s based on academic work on anthropomorphic robot faces: how we perceive emotional cues from faces. It is also about the stress of “Emotional Labor”, performed by e.g. healthworkers, who have to be nice to people all day. Check. The idea of literally putting on an attentive face horrified me, and the photos of the wearable eyes gave me The Creeps. Check. I’m horrified by the idea of a future where service workers literally wear masks to convey happiness rather than reveal their uncaring, drab reality. Once the initial revulsion passed, I started thinking seriously about how a mask-of-attentiveness might in some cases be beneficial or stress reducing. Check. The video is pure Performance Art. I truly can’t tell whether he’s serious about this or not – I believe he is. Now that I’ve teased you, here’s the photo. Note how in most of the photos, he’s wearing the same expression – except for his cyber-eyes. Dr. Hirotaka Osawa’s work on automatic, always-attentive eyes. Pippa here, giving my particular point of view on happenings. Love the new site, because I can post under my own name at last! The only thing that would make it absolutely perfectatious would be smell media – I mean, I’d love to smell to my friends about the growing herbs in the garden, the chipmunk in the log pile, Linda’s sock – which is Bliss Itself – and how much fun I’m having at Tracey’s Nose Work Detectives class! The original Independent Nation of Needhamia was built before 2000 – literally in the past century. …and seriously needed an update. Now with the power of WordPress, the Co-Presidents and Court Canus Minor have joined the at-least-recently-modern world! See About Needhamia for tours of the ancient ruins of the Old Needhamia (e.g., The Ministry of Education). As I was going through old photos, searching for an appropriate background for the site, I stumbled upon this unaltered screen capture from The Queen’s Christmas Speech of 2013. I suspect that the speech had run a little long, and poor DirecTV could do nothing but report what the schedule said was on.